April 10, 2019 at 9:52 am. 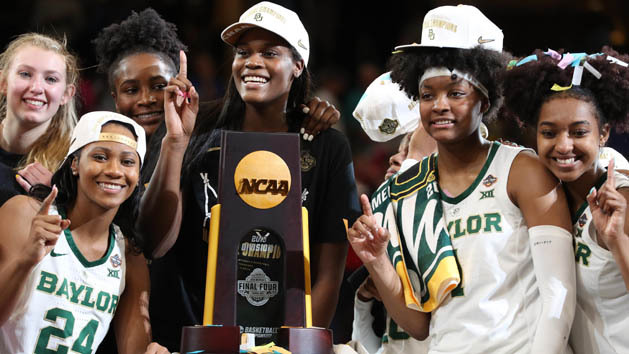 Baylor guard Chloe Jackson again showed how she can affect a game in several ways in Sunday’s 82-81 win over Notre Dame in the women’s national championship at Amalie Arena in Tampa. With the game tied at 80-80, Baylor head coach Kim Mulkey ordered a clear-out in the middle of the floor and Jackson took a step on the defender and scored on a layup with five seconds remaining. Jackson finished with a career-high 26 points as she made 13 of 25 shots in playing the full 40 minutes. Those last five seconds had an immense amount of drama as Fighting Irish coach Muffet McGraw immediately called timeout to set up her last play. On the inbounds pass, Arike Ogunbowale took the basketball and drove to the basket and drew a foul on the Lady Bears’ Moon Ursin with one second remaining. Ogunbowale, who led all scorers with 31 points, missed the first free throw and made the second. McGraw said that, of course, Ogunbowale needed to miss the second so the Fighting Irish could try to get a score off an offensive rebound to force overtime. Jackson scored 10 points in the first quarter as Baylor jumped out to a double-digit lead at 25-14. Her quickness was a tough matchup throughout the evening for the Fighting Irish. The 5-8 senior even played throughout the fourth quarter with four fouls as she picked up that fourth with 9:26 left in the game. Mulkey was referring to the untimely injury to 6-4 junior Lauren Cox who left the game with an apparent knee injury with just over a minute remaining in the third quarter and the Lady Bears holding a 62-50 advantage. Cox, who is a staple on the team, complements 6-7 Kalani Brown impeccably well in the post. She’s a face-up shooter who can change matchups. With Cox out of the game, Notre Dame made a mad rush as the Fighting Irish are a noted fourth quarter team. Marina Mabrey made three triples in a 2:03 span as her third tied the game at 74-74 with 5:18 to play. Freshman NaLyssa Smith stepped up in a big way for the Lady Bears in the fourth quarter with six of her 14 points. For Jackson and Brown, Baylor’s only two seniors, those careers came full circle with the national championship. Brown reached 2,000 points and 1,000 rebounds in her four years at Baylor, while Jackson, a graduate transfer who played at both N.C. State and LSU, averaged 13.5 points and 4.9 assists in the six-game run to the NCAA title.